On my last trip to Salem, Massachusetts I attended a very funny play at the Salem Theatre Company, had a tasty meal at Red Lulu Cocina & Tequila Bar, toured a beautiful home that was festivally decorated for Christmas with more Santas than you could shake a Yule Log at, chowed down on the best seafood chowdah on the North Shore in the Hawthorne Hotel's Tavern before venturing up to their roof to watch Santa arrive with the help of the Salem and Swampscott Fire Departments much to the delight of the crowd waiting below in Salem Common, and toured four more homes as part of the Christmas in Salem Historic House Tour. That's a lot to fit into two days but before I did any of that I revisted a place in Salem that I first went to back in 1975. These days I doubt that Nathaniel Hawthorne's classic 1851 Gothic Romance The House of the Seven Gables is required reading in too many high schools but when I was a junior it was and, following our dissection of the book that tells the story of a small New England family who reside in an old house that was cursed by a man who was hanged for witchcraft, we took a field trip to Salem to visit the very house that is believed to have inspired Hawthorne's follow-up novel to The Scarlet Letter. Hawthorne claimed that the house featured in the book was not copied from any particular edifice in Salem but was merely a compilation of various Colonial houses that were built from that same style of architecture and that any similarities between the 1668 dwelling that was owned by his cousin Susannah Ingersoll and the house that was owned by the Pyncheon family in his book were purely coincidental. Honestly though Nathaniel, I don't think too many people ever bought that and over the years the Turner-Ingersoll Mansion in Salem became more popularly known as The House of the Seven Gables. It was there that I went with my English class in 1975 and to there that I returned on my last trip to Salem. As a rule I've come to the conclusion that revisiting places that I've been to in my youth is generally not a good idea as the visit usually ends up being somewhat disappointing once I realize how much my memories don't match up with my current surroundings; however, I was hoping that wouldn't be the case with a return visit to The House of the Seven Gables being that when the house was last purchased in 1908 it was restored so that it would be as close to the description of the house in the book as possible. My feeling was that if the book hadn't changed over the years - and it hadn't - that chances were really good that the house hadn't changed too much either and I wouldn't be taking the tour and thinking "This is nothing like I remember it." 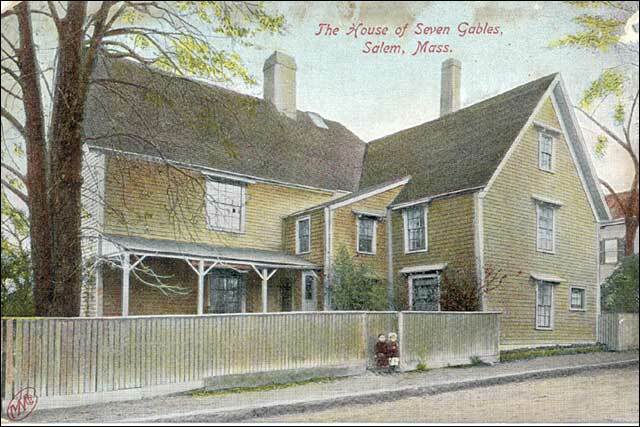 As it turns out, The House of the Seven Gables itself hasn't changed much since that first visit long ago - though not quite as long ago as the picture above! - but the site of the house most definitely has. Where once visitors merely got to enjoy the mansion itself and the beautiful grounds on which it stood, the property now constitutes its own national historic district when it was added to The National Register of Historic Places on March 29th, 2007. In addition to the Turner-Ingersoll Mansion, visitors will find The Retire Becket House (1655); The Hooper Hathaway House (1682); The Phippen House (c 1782); The Counting House (c 1830); The Seaside Gardens; and Nathaniel Hawthorne’s Birthplace (c 1750). The latter in the list is to be the subject of this post once I finish tidying up some background information! 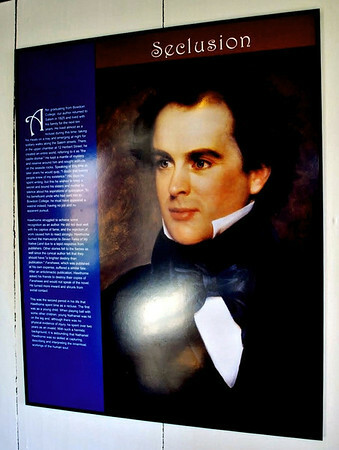 Even though visitors start their tour by walking through the mansion house, I'm going to start out with the birthplace house of Nathaniel Hawthorne as were it not for Mr. Hawthorne, chances are good there might not be a tour offered at the mansion to begin with. Though Hawthorne made those denials that there wasn't any connection between the real-life Turner-Ingersoll Mansion and the fictitious Pyncheon Mansion, when the home was bought in 1908 by Caroline Emmerton, a Salem native who was a preservationsit and philanthropist, she worked closely with architect and historic preservationist Joseph Everett Chandler to restore the house's original seven gables and to make the mansion become as close as possible to the one Hawthorne meticulously described in his book. Ms. Emmerton's goal was to preserve the house for future generations by turning it into a museum with the proceeds going to assist immigrant families who settled in Salem as well as other social programs. 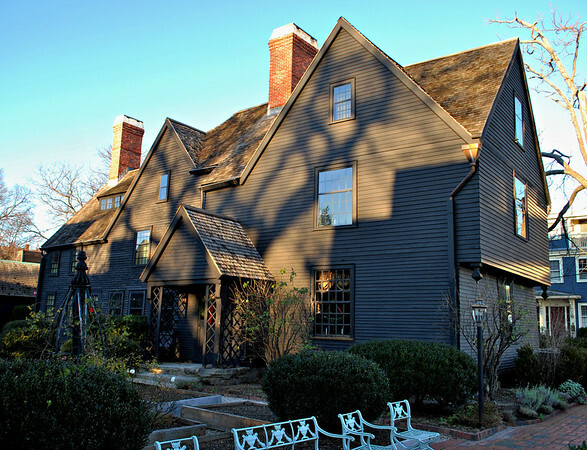 Since then thousands of visitors have made the trip to Salem to visit the house where the sins of one generation were visited upon the next whether Hawthorne based his novel on that particular house or not and the proceeds from those visits continue to help the less fortunate and local social programs through The Gables Settlement Association. I'll tell you more about that in my next post. For now, enough about the mansion house as I'll be writing more on that soon; instead let's concetrate on the house where Nathaniel Hawthorne, a man who was recognized as the first American writer on par with writers from Europe, came into the world. 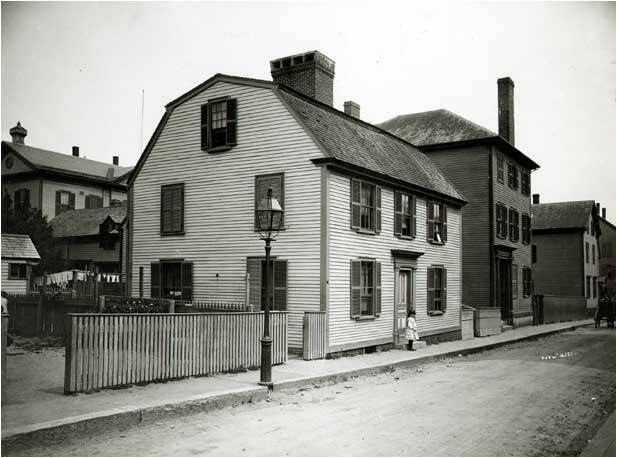 The Georgian-style house which was originally located at 27 Union Street - fairly close to the hotel that now bears the Hawthorne name as well as the park where his statue sits - was the home of Nathaniel's paternal grandfather, Daniel Hathorne and his wife Rachel Phelps Hathorne who purchased the home in 1772. In 1775, Nathaniel Hathorne, Sr. was born in the house some 29 years before his son of the same name. Like many of his ancestors before him including his father, Nathaniel chose a life at sea sailing aboard the ship America in the late 1780's before sailing on the Perseverance in 1796, a ship that was owned by Simon Forrester, a privateer and merchant who became one of the nation's first millionaires and who also happened to be the husband of Nathaniel's sister Rachel. The same year that Nathaniel set sail on the Perseverance, Daniel Hathorne passed away and Nathaniel inherited the house on Turner Street. On August 2nd, 1801 Nathaniel married Elizabeth (Betsey) Clarke Manning and their first child, Elizabeth, was born in the house on March 7th, 1802. 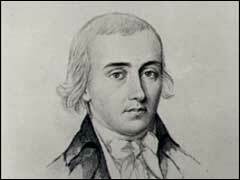 A little over two years later on July 4th, 1804 their second child, Nathaniel, was also born in the house. During both births, Nathaniel, Sr. was away at sea but he returned to Salem later that year to see the son who bore his name for the first time. Having obtained the rank of Captain like his father before him, in November of 1804 Captain Hathorne was inducted into the East India Marine Society which was "composed of persons who have actually navigated the seas beyond the Cape of Good Hope or Cape Horn, as masters or supercargoes of vessels belonging to Salem." The society functioned as a charitable and educational organization and also maintained a library and museum. On December 28th, 1807 Captain Hathorne set off on what would tragically be his last voyage on the Nabby bound for the Republic of Surinam in northern South America. A mere two weeks afterward on January 9th, 1808 Elizabeth gave birth to their third child Maria Louisa but her father never saw her as less than four months later in early April of 1808, Elizabeth received the news that Nathaniel had died from yellow fever in Suriname (Dutch Guiana) leaving her a widow with three small children to raise. Following Captain Hathorne's death, the house on Union Street and all of the furnishings therein were sold to cover his debts forcing Elizabeth and the children to turn to her family for assistance. The small family moved from the house on Union Street to the Manning family home on Herbert Street where they lived with her parents and her eight siblings who ranged in age from seventeen to thirty-one. Elizabeth's brother Robert Manning took on the role of surrogate father to her children as Elizabeth fell further and further into depression. Taking to her room, she let her family raise the children as she mourned the loss of her beloved husband. I could probably go on and on about Nathaniel Hawthorne telling you that he suffered a minor leg injury in a ball game when he was a child that left him lame for several years; or that he added the "W" to his name after he graduated from Bowdoin College in Maine before he began publishing in order to distance himself from his great-great grandfather Justice John Hathorne, the chief interrogator of the accused in the Salem witchcraft hysteria of 1692 and the only one who never repented for his involvement in the deaths of 19 innocent people; or that one of Hawthorne's best friends in college was Franklin Pierce, a man who later went on to become President of the United States; or that when Hawthorne married Sophia Peabody on July 9th, 1842 none of his family attended the service as they didn't approve of his choice of wife or ... well, lots more but this post isn't supposed to be about Hawthorne. This post is about a house whose only real claim to fame is that of being the dwelling where the writer whom Edgar Allan Poe once described as being of "truest genius" was born. The house remained at 27 Union Street nearby the Immaculate Conception Catholic Church until 1958. When the last owner of the house passed away, the property was left to the church which decided that a bigger parking lot was needed and the house should be removed. Rather than just tear it down, though, the building was offered to The House of the Seven Gables Historic Site for the low, low price of $1 with the stipulation that it had to be moved within a week. A difficult task but obviously not impossible as, with the assistance of architectural historian and conservator Abbott Lowell Cummings, the house was successfully moved to its new address at 27 Hardy Street where it became part of the non-profit museum immediately adjacent to the Turner-Ingersoll Mansion. Before giving you a virtual tour of the house, I should mention that as a rule photography is not allowed during house tours primarily for security reasons but also because the use of flash could eventually cause damage to the property and the contents. After taking a regular tour of the house along with several other visitors the first day I arrived in Salem, I was very fortunate to have been invited back the following day for a private tour of both the mansion and the birthplace house that was given to me by the Deputy Director and Curator of The Gables, Alan Collachicco, a wonderfully talented and creative man who obviously loves his work and knows his Hawthorne! I spent a delightful two-and-a-half hours with Alan walking through both houses as he imparted some of his vast knowledge and enthusiasm while answering any and all questions as I took photos for my posts. So, enough blathering, how about I finally show you the inside of the house? Built circa 1750, the house was designed in an architectural style that was typical of that period of time possessing a central chimney, a post-and-beam doorway, front and back stairways, and a Gambrel roof (a symmetrical two-sided roof with two slopes on each side). Visitors entering through the front door find the kitchen is to the right on the ground floor with the main room to the left while upstairs there are front and back rooms on both sides. For this virtual tour we're going to take a left and start out in the front room of the house where visitors will see a portrait of Hawthorne's Aunt Rachel on one wall along with another portrait of a friend of Nathaniel's father near a fall-front desk (or drop-front if you prefer) that is a period piece which has no relationship to Hawthorne at all. With the exception of just a few pieces, the furniture currently featured in the house consists simply of pieces that would have been typical of a middle class home in the 1800's. On the desk are copies of "The Elephant" which tells the story of the first elephant that was brought to America by Captain Nathaniel Hathorne for the Crowninshield family of Salem. For those who have read The House of the Seven Gables, you might remember that Hepzibah sells gingerbread cookies in the shape of elephants in her cent shop that are the favorite of young Ned Higgins - a part of the story that was no doubt inspired by that very first elephant brought across the seas from India to the shores of Massachusetts by Nathaniel's sea-faring father. An elephant that quite liked to drink beer as a matter of fact but I'll leave that story for you to hear when you go to The Gables yourself! In the back room, there is a portrait of Nathaniel Bowditch, an early American mathematician whose work was instrumental in seafaring navigation. A native of Salem and the author of Bowditch's American Practical Navigator, Bowditch is often credited as being the founder of modern maritime navigation. Appropriately, on the wall near his portrait are several tools that were used for ship navigation. Another desk in the back room is also a fall-front desk which dates from 1735-1740 and is of the George II design that could be folded up in order to be taken to sea. On my tour of the house the first time, our tour guide told us that there were secret compartments that could be found in the desk. No doubt sea captains probably had a few things they wanted to hide away from prying eyes once in awhile! Before going into the kitchen, we went upstairs where in the rooms on the right side of the house as you face the front there were several displays of period furniture which included a yellow high chair that Nathaniel sat in when he was just a baby. The mirror reflects a portrait of Nathaniel that is on a display that tells of the years after he returned from Bowdoin College when he lived basically as a recluse while trying to establish himself as a writer; he later said that during that time, "I doubt that twenty people knew of my existence." On the other side of the house upstairs, visitors enter a room that would have been referred to as the Parlor Chamber or what we might think of as a bedroom; however, in Colonial times this room would have served as much more than a bedroom as it would have been the room for the family to gather together in and spend a good part of their day, particularly if it was located in a house like the one where Elizabeth Hawthorne went to live with her many relatives after Captain Nathaniel died. In that case it may have been more like what we would today call a studio. The room has a large fireplace along with a trundle bed circa 1820-1825. The bed has a rope frame which periodically needed tightening, an act that coined the phrase "Sleep tight". The beautiful canopy and bed belonged to Becca Haskell, a special friend of The Gables Settlement Association who spent many years restoring the house and finding period pieces for it; when she died, the bed was donated to the museum and it now holds a place of honor in the house. The pitcher and basin on the table in the picture above was located in a smaller room at the back of the Parlor Chamber and was about as close to a bathroom sink as you were going to get in the house while a pair of iron curling tongs for hair is on the lower shelf and a chamber pot is on the floor below. I guess you could say it pretty much defined the bathroom in the home. As much as I love older houses, I'm thinking that I might not have loved the older lack of amenities such as indoor plumbing too much! Returning downstairs, we then toured the final room in the house that is open to the public - the kitchen with its massive hearth and fireplace and objects that would have been used during that particular period of time. As you can see the room was simple yet functional providing the family a place to prepare and serve meals. On the wall near the fireplace is a poster with a picture of the house being moved from its original location at 27 Union Street to its new home in The Gables Complex. As I mentioned, there is currently not much in the house that relates to Hawthorne but that's going to change coming in January as Alan has plans to display some of the vast collection of Hawthorne objects and memorabilia that The Gables Association possesses. During the first two weeks in January when the museum is closed, the main front room of the house will be stripped of its current furnishings and made over with what will be ever-changing exhibits of Hawthorne's personal affects which include a snuff box that he was given at age 14 and which he held in his hand at the time of his death on May 19th, 1864 in Plymouth, New Hampshire as well as first-edition books and the chair that he used when he would visit his cousin Susannah at the Turner-Ingersoll Mansion. The current fall front desk in the room will be replaced by Hawthorne's desk where he sat to write The Scarlet Letter and The House of the Seven Gables. The upstairs rooms will be converted to exhibits and displays of the family which will include illustrations by Sophia along with letters and other memorabilia from their three children - Una, Julian, and Rose. Rather than just a house containing period furniture and a Hawthorne item or two, the house will become more of a museum dedicated to Nathaniel Hawthorne and definitely more interesting for readers who want to know more about the man who suffered from his own personal demons - demons that he brought to light and exposed in his writings that were set in New England and centered around the inherit evil and sin of humanity. No doubt the house will bring Hawthorne more to life for visitors just as the homes of writers such as Poe, Twain, Emerson, and Alcott do. Personally I am quite looking forward to the transformation! 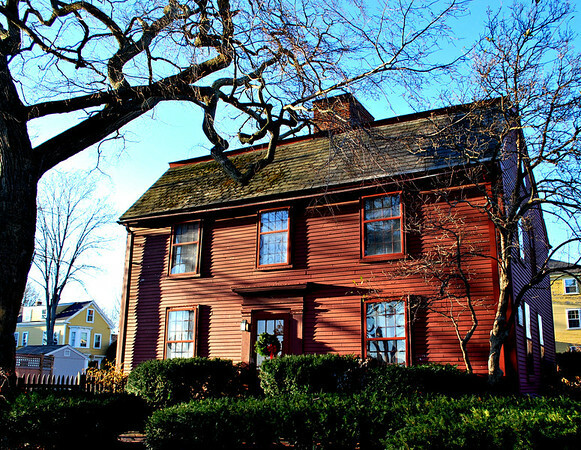 If you find yourself in Salem and you'd like to make your own visit to the Nathaniel Hawthorne Birthplace House as well as the other buildings at the National Historic Landmark Site and see history come alive firsthand, their Hours of Operation can be found here along with information on Rates, Special Events, and Group Tours here. For those who think that the $12.50 Admission Fee to tour The House of the Seven Gables is high (having read a few reviews on Yelp I know you're out there!) may I just point out that not only do you get a tour of the oldest wooden mansion house left standing in the United States as well as the birthplace house of Nathaniel Hawthorne conducted by very knowledgeable and personable guides, but visitors are free to walk around the colonial seaside gardens and the rest of the property at their own pace. Additionally, the cost of the ticket goes towards funding the many programs that The Gables Association supports so in buying a ticket, not only are you helping yourself to one of the best attractions on the North Shore but you're also helping others. Definitely a win-win situation! I hope you'll come back for my next post where I'll continue my visit and take you on a virtual tour of the Turner-Ingersoll Mansion and show you around a bit. Heck, I might even show you the house's hidden staircase if you're good! LOVE LOVE LOVE the 9-patch quilt, the hearth, the spinning wheel and that padded rocker. Did I mention I love the hearth? One my mother's sisters use to own a humongous house which is located at the very top of Big Nahant and it has a hearth quite similar to that. Back then, the hearth truly was the heart of the home, which is why I am sure that it is no coincidence that hearth begins with heart. I so need to move back home. Yup, that was pretty cool. And is it wrong to think that Nathaniel Hawthorne was a hottie? Who knew? 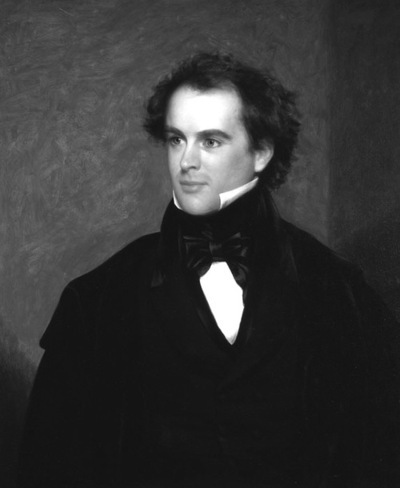 Actually, Nathaniel Hawthorne was a hottie! And we are taking advantage of that this February with a special contest. Stay tuned to the Hawthorne Hotel on our blog, or our FaceBook page, or on Twitter so you won't miss out!! Absolutely stunning! I sometimes wish I had lived in that era, but I too would have missed the bathroom plumbing! Please continue with more of these amazing stories and facts, and most of all photos. I had the pleasure of visiting Salem with my daughters a few years ago because they knew I was in love with Nathaniel Hawthorne's books. Thank you for this series!! Also, price is not an option, you must see this place at all costs!!!! Very reasonable prices everywhere in Salem. You WILL NOT be disappointed with your trip here. I came on Halloween and it was amazing!!! Thank you for wandering by and leaving a comment today! In a recent post on the beautiful Inn Victoria in Chester, Vermont, I mentioned "triple-sheeting" and a commenter asked, "What's triple sheeting? Is that the same as being 3 sheets to the wind??" Uhm, no, Sarah, it isn't! Though I can certainly appreciate the humor in your comment! Triple-sheeting, a style of bed-making that uses multiple layers of sheets, blankets, and duvets or bedspread-like covers, is something that a lot of upscale hotels, inns, and bed and breakfasts are starting to do as it's not only an easy way to change the design of the room should that be desired but it's also a lot more hygienic for guests. 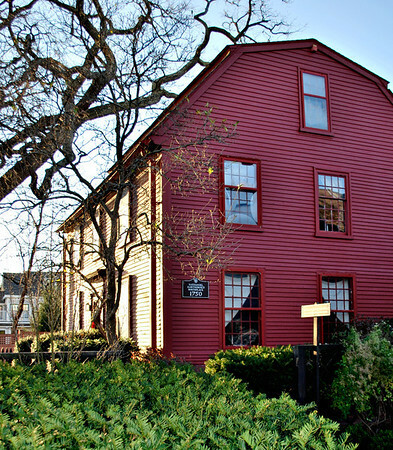 Whether he meant it to or not, the dwelling that took on the life of the "rusty wooden house" in Hawthorne's second novel, and which became popularly known as The House of the Seven Gables, began its story in 1668 as the house of a prominent Salem resident before almost 240 years later taking on the role of a social reform-based settlement house and museum. 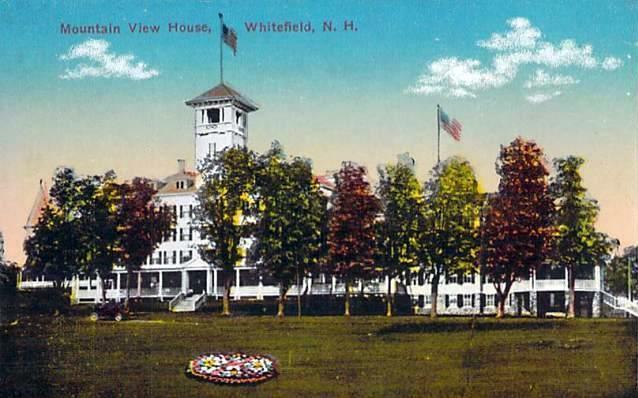 I remember it very well - the very first time I laid eyes on the Mount Washington Hotel in Bretton Woods, New Hampshire and told myself that someday I was going to stay there. It was August 20th, 1991 and I was on my honeymoon with my now-ex husband; we had spent the day at the Mount Washington Cog Railway and had decided to return to our Franconia inn via the Kancamagus Highway to take in the scenic views. To get there we had to travel down Route 302 and as I looked to the left I saw it - the grandest of the White Mountain's grand hotels. If You're Looking to Take a Journey Somewhere in Time, New Hampshire's Mountain View Grand Resort & Spa Is the Place to Do It! Long ago, when I was a lot younger than I am now, I went to the movies to see "Somewhere in Time" with Christopher Reeve and Jane Seymour. It was a time-traveling love story that not only left me wishing I had more tissues in my pocket but with the impression that there could be nothing more romantic than a big grand hotel like the one in the movie. "Somewhere in Time" was filmed at the 1887 Grand Hotel on Mackinac Island in Michigan and the name is definitely spot-on however I'm very happy to say that it isn't the only grand hotel in America nor is it the only one with an interesting history - it's just the only one with that particular name! The Ahwahnee - Yosemite National Park's Historic Hotel & The National Park Service's Premiere Example of "Parkitecture"
If there's one location in the Continental United States that everyone should have on their Bucket List to see at least once it should be Yosemite National Park in California. Formerly the home of the Southern Sierra Miwok Indians who called themselves the Ahwahneeche, Yosemite is now the destination of over 3.7 million people annually who visit the park to take in its spectacular granite cliffs, beautiful waterfalls, clear streams, and Giant Sequoia groves - most of which were made famous by American photographer and environmentalist Ansel Adams' stunning black and white photographs. Major vacation destination that is, Yosemite offers visitors many lodging options but none are quite as spectacular as the park's historic AAA® Four-Diamond hotel The Ahwahnee which was the brainchild of Stephen T. Mather, the man who was appointed the country's first National Park Service Director in 1917 and who essentially developed the NPS as we know it today. Santa Claus Came to Town and He Did It in Style!